Experience this not-so-much-hyperealistic hotline operator simulator thinggy of a game. Answer calls and transfer them to the right services. Strive to become "Employee of the Month". But beware, your actions are being monitored. Fail one time too many and there will be... unforeseen consequences. This game was created in less than 72 hours by 4 students from the Enjmin game school. And we still had some time left for sleeping... kind of. Hotline Mamazon was created by 4 students from the Enjmin game school in France. We tried our best but forget the typos if you notice them. See the credits for further info. 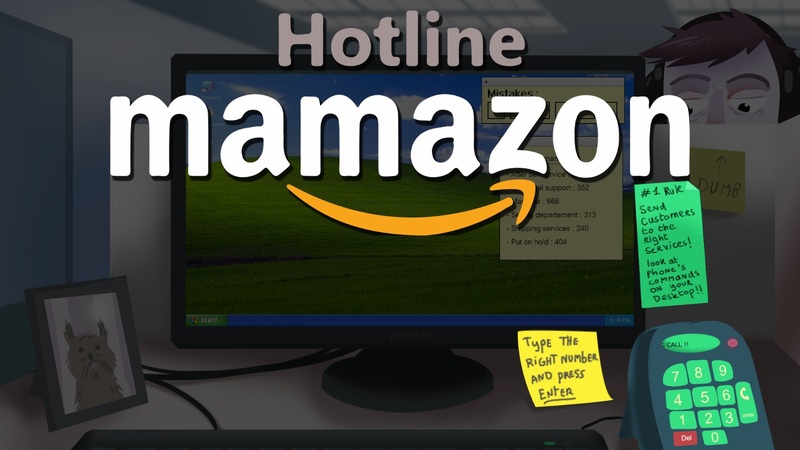 This game was inspired after our game designer spent 2 hours with Amazon customers services hotline. So we figured this would be an idea as good as any to start with. This idea eventually turned into that thing of a game. The build is polished... kinda. This is supposed to final release. If you find any bugs, you are encouraged to report them. Use earpieces not to disturb your neighbors or put volume to maximum to be a total douche. Download the archive, extract the files and have a good one ! If you liked the game, please consider leaving a comment, feedback is always welcome. it shows that its not available for windows :( could you give me a download link? Hi ! Like I just said to someone else, even if the Windows logo isn't displayed, the archive still is a .exe file. that's awesome! thank you. itch.io stills says not available for windows tho. Silly me, I had forgot to tick the right box to display the Windows logo. Still, the archive is a .exe file. I'm using my computers default resolution on the game but It still can't show half of the numbers. What is your resolution ? Normally the Unity launcher should stretch the view according to your screen. Its 1024x768 I'll send you a screenshot if you need it. Yeah, I just checked it. I think the problem is not the resolution itself, but the fact you're using a display with a 4/3 ratio. I'd suggest you to switch to any 16/9 ratio resolution. The game was not designed to fit with different ratios other than the most common one. Sorry if you can't play the game it because of that. Thanks for your time though I'll try it. AMAZING GAME. So much fun from his game. I'd love to see new lines introduced into the game. Hi, glad that you liked it. That's a very good video you did. It's really motivating to see that your creation actually interests someone. Thanks for sharing your input, I really appreciate it. I'll try to get our nose back to the grindstone on Mamazon if we have the time. Keep up with the good stuff !